Soybeans are fungible. Actually most oilmeals are fungible. It’s a big world, and US crops will find a market. Brazil et al are not going to increase production at these price levels. Truly, the triump of faith over trade theory. This entry was posted on September 21, 2018 by Menzie Chinn. The strange comment was written by “The Farm Dork”? Figures! 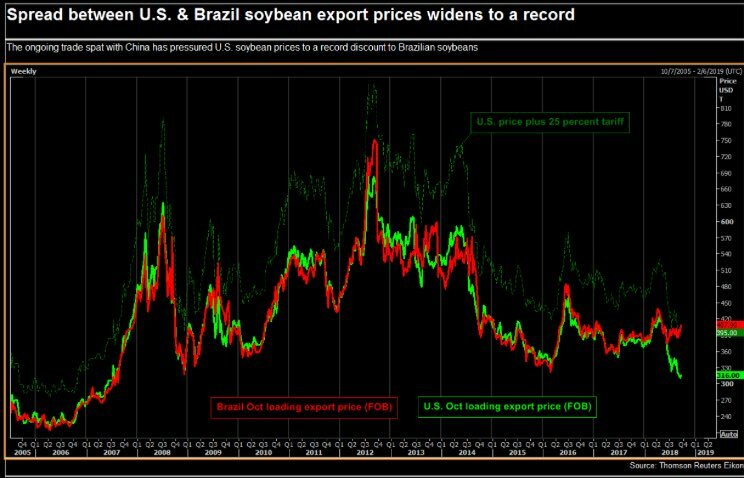 Menzie, correct me if I am wrong, but what I see in the chart is that Brazil beans are selling at a 25% premium over US. Isn’t that the same as the Chinese tariff? To me that means that immediacy or availability would drive purchases. The chart isn’t clear enough to clearly show tariff price. Could you describe that. Let’s make this simple for you. The increase in Brazil’s price to the Chinese is the incidence of the tariff paid by the Chinese consumer. The drop in the US price is the incidence paid by the Iowa farmer. Of course there is a 25% difference – DUH! Oh wait, US prices have fallen a lot whereas the price Chinese consumers have gone up only a little. So most of the incidence is being borne by those Iowa farmers. This is the clear message Menzie has been shown us in post after post. Of course CoRev will continue to do his thing – fret and fuss over the details in his drive to go “LALALALALALA, not listening”. GEESH! Here’s a triumph of faith for “This Farm Dork”. Take a large crap in one hand, make a wish for USA/Brazil soybean price spread to narrow soon in the other hand, and see which hand fills up first. By any chance is “This Farm Dork” a Joel Osteen and/or Oprah Winfrey fan?? I have a strong theory he is. First, This time series clearly shows that Soy prices have decreased far more and faster many times in the past. Yet both the U.S. and Brazilian Soy industry survives. The aggregate farm income series mentioned earlier shows the same. There is nothing unprecedented about current farm price and income declines. Second, the Chinese imposed these tariffs. They are being at least as moronic as Trump. Third, the persistent divergence shows that there are “buyers” deliberately overpaying for Soy, without collecting any tariffs. So there are even bigger morons out there. Why is everyone is fixating on Trump and ignoring all the other morons on trade? First, TDM ignores the key point that the time series shows Brazil and U.S. Soy prices previously tracked each other very closely. Third, huh? That’s not how this works. Dave TDM is right about one thing: Second, the Chinese imposed these tariffs. They are being at least as moronic as Trump. In terms of the pure economics retaliating with tariffs of their own makes no sense. Those tariffs will make Chinese consumers worse off. So in that sense they are being just as moronic as Trump. But this gets to why Trump is likely to lose this trade war. The Chinese aren’t looking at the trade war in terms of maximizing economic welfare; they are looking at the trade war in terms of demonstrating political will and dominance. That’s a loser issue for Trump because the Chinese can stand the economic pain a lot longer than American soybean producers. I guess moving away from any risks of overreliance on US in anyway serves China’s longterm strategic interests. The trade war just provides added impetus and accelerate the efforts.